NOTES: 2016 reissue of a 1974 snap kit. The Opel GT is a front-engine, rear-drive two-seat sports car manufactured and marketed by Opel in two generations — separated by a 34-year hiatus. 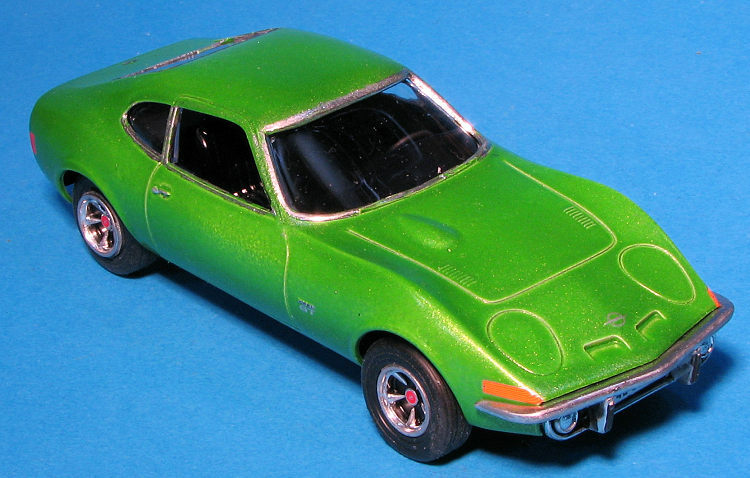 The first generation Opel GT (1968-1973) debuted as a styling exercise in 1965 at the Paris and Frankfurt motor shows. The production vehicle used mechanical components from the contemporary Opel Kadett B and two-door hard top bodywork by French contractor Brissonneau & Lotz. The styling of the GT was often cited as similar to the 1968 Chevrolet Corvette which went on sale in September 1967. Opel marketed a second generation GT (2007-2009) as a rebadged variant of the Saturn Sky/Pontiac Solstice two-seater convertible, manufactured in Wilmington, Delaware, USA. According to the kit box art, driving one of these ensures you will gain the attention of buxom bikini-clad babes. A bit of research shows that this kit was initially released in 1974 as a snap kit. Apparently the kit has been modified in some way. Though the parts count in low (25 pieces), there are steps in the instructions that show gluing required. I am also assuming that the older kit had a chrome plated sprue where this one does not. You get a one-piece body with a one-piece windscreen/backlight piece. The interior is a full tub into which you install the seats, instrument panel/dash and the steering wheel . There is no shifter. This fits into the body. The undertray accepts two plastic axles. Wheels consist of a rubber tire, an insert and then the wheel insert. Though the built model shows white wall tires, that is apparently the insert I previously mentioned. How this works is unsure, but it looks nice on the build up. As mentioned, the chrome all needs to be painted or covered with foil unless you are one of those modelers who cleans up the part and sends it out to be done by the pros. The instructions are quite large and full color so following the painting guide should be pretty straight forward. Things like the turn signals and chrome labels are decals and you are provided with a wide selection of European license plates. You would think that a kit that used to be a snap kit would be really easy to build. Well, perhaps. First thing one has to do is some parts clean-up. All the bits have some level of flash or 'gunk' on them. The body is the most important part of all this and so I first started removing the mold seam. On the left side near the base of the windscreen is a particularly nasty seam that is really a bit of a chasm. Sanding did not get rid of it and it took several applications of filler to finally get it properly smooth. Learn to become one with your sanding stick/sandpaper as you will be spending quite a bit of time with each other. Once that was done it was time to give it a nice coat of primer in preparation for painting. Meanwhile, I cut the bumpers free from the sprues and painted them. These are supposed to be chrome and for this I used a paint pen from Liquid Chrome. It really seems to do the trick and looks a lot better than any other paint I've used for this purpose. You do need to be sure you get the plastic very slick. I did not and the close up shows this. Then again, I just wanted the parts to be chromed as I don't build contest models. After the grey primer had dried, I sprayed on some white to prep it for the top color. Meanwhile I glued i n the seats then painted the interior in black along with the dash. The underpan and axles were painted NATO Black. Next step was to attach the decals to the instrument panel and center of the steering wheel. These decals are superb and actually the highlight of the kit. Standard Microsol setting solution is all that is needed to get them to snuggle down. The body was then sprayed with the lime and gold metalflake from the Testors laquer line. This is a rattle can paint. When fully dry, I used the Liquid Chrome pens to do the trim, though it didn't go as well as I'd have liked as the detail along the roof of the side and front windows disappeared, leaving me with no line to follow. That was also left to dry and then I snapped in the interior, the dash, and then the rest of the interior. This was a very difficult job and though I'm sure it was designed for kids, the amount of grunt this kid had to put forth to get the bits to click in place was considerable. The rear bumpers did not stay in place and had to be glued. Front bumper and grille, installed after painting the black areas, is not a good fit at all. Actually, the rear ones have rather large gaps where they fit as well. I then attached all the rest of the decals, choosing French license plates for this one. The tail lights were painted red and orange. For the wheels, I first painted the black areas, then used the chrome pens for all the rest. These pens are great when you have a car kit that does not provide chrome bits and should. Inserting the wheels into the tires was another matter. The wheels are smaller than the openings in the tires. The way I got around that was to put several wraps of 5mm kabuki tape around them to beef them up. They are still a bit loose, but nothing major and is something most of us can live with. The axles were inserted in the wheels and threaded in place. Final act was to snap the chassis in place. Again, an exceedingly tight fit that requires more grunt than you'd think. For those wondering, there is no tailpipe assembly included, so the adventurous will need to make one. For a snap kit, this one certainly has its share of fit issues. Perhaps it is the age of the molds, but whatever it is, it will not be winning any contests as it is. I built it as I wanted to build a car and actually finish it (something of which I have issues when it comes to car models). It is also a scale that will look nice displayed on my slot car track. The end result is pleasing enough, but you do need to be aware that it may well be a disappointment for the youngsters.